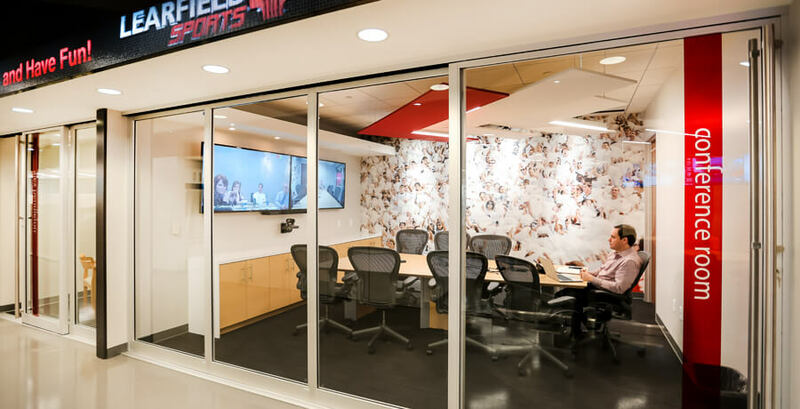 Learfield Sports, a collegiate sports multimedia and sponsorship firm, further expanded their facility in Dallas to accommodate a new entertainment suite, training area and additional office space. V Three Studios worked closely with the client in order to create an efficient design that also achieved the complex requirements of the project. 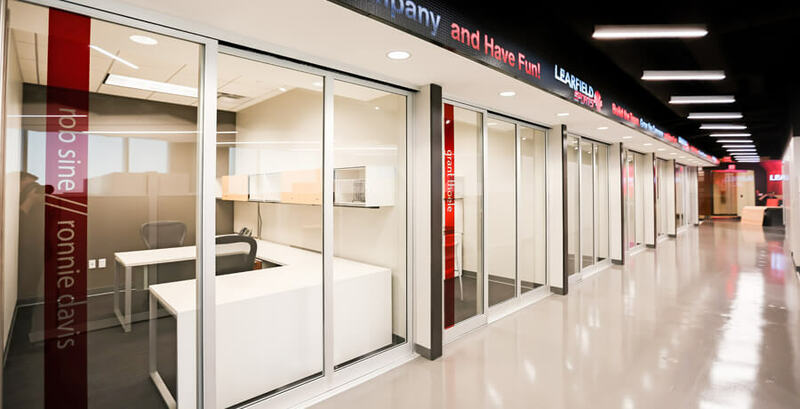 The 4,700 sq ft suite was transformed into a multi-functional and technologically advanced space that meets the needs of the growing company. The features of the completely renovated suite include a unique lobby, a large multipurpose entertainment space with a bar and flexible seating, a full kitchen, an employee training area, a video conference room, and five private offices. The design reflects the athletic aesthetic of the company’s brand, featuring wood walls resembling gym flooring, stadium-style seating, wood and aluminum bleacher seats mounted to the lobby wall, a 60-foot LED ticker running along the corridor, and a 21-panel LED screen wrapping from the lobby wall onto the ceiling and extending into the multipurpose space. A glass wall separates the lobby from the entertainment space, meeting a curved exterior wall with unique booth seating spaces for entertaining. These unique touches make this new addition feel like an extension of the company’s culture and are sure to make a lasting impact on visitors to the space.